Everyone today acknowledges the benefits of practicing Yoga to remain healthy. However, there are a lot of individuals who get deterred or intimated thinking it is very difficult. 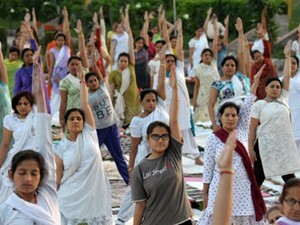 International Yoga Day is now being celebrated each year on 21st June. This has been one of the greatest initiatives by our Prime Minister, Shri Narendra Modi. This has given a lot of attention and focus to Yoga which was long overdue. It is better suited for younger people. It is meant for only those people who have health problems. Fat or obese individuals cannot practice equally well and get all its benefits. One has to go to a crowded class and practice with others in a cramped situation. One cannot practice at ones own pace and as per ones own convenience. You need to buy mats and Yoga clothing to practice. You cannot practice it at home. You need a teacher to come over and pay lots of money to teach. It cannot be done daily. You have to do a lot of complex and convoluted asanas to get benefits. The more difficult practices are better. Householders cannot be serious about Yoga. All of the above are popular misconceptions or myths about Yoga. The very fact that these are myths means none of these are true. So how do we go about starting Yoga? One of the best ways to do so is by going to credible experts and learn online. There are so many gentle and simple practices you can do forever and get all the benefits you would have got from even the most complicated asanas. Pick up gentle asanas which you can learn online for free and practice them at home for fifteen to twenty minutes on a daily basis. If you cant practice daily, then try practicing four times a week. Do not worry even about the time. Practice whenever you have the time, be it morning or evening. Just make sure, you are on an empty stomach. There is enough of a body of personal experiences of thousands of people as well as a growing body of scientific research which clearly states there is no need to practice for long hours, spend money or do complex asanas and pranayamas. Even the most simple practices give great benefits as the more complicated hatha yoga postures. To make things easy for you and get you started, just follow these basic asanas whenever you can on an empty stomach. Practice these for ninety days and see great benefits ‘kicking into’ your life. Once you are on your way, you may choose to pick some great programs from genuine and authentic Indian Yoga Classes. If you want to know more about authentic and genuine Yoga from India, please do visit the FAQ Section.